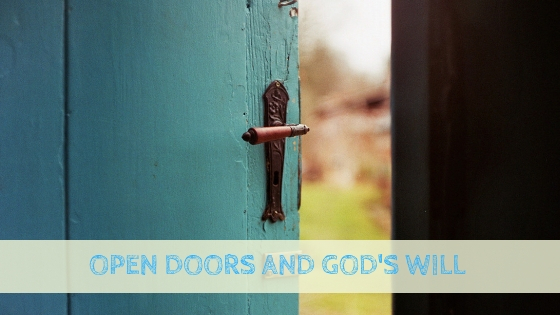 Most of us, in our pursuits of God and His will for our lives and ministry, seek open doors, which God opens. Finding open doors comes as a result of knocking and seeking and finding. The secret is to have a door that God opens, opened to you, and not one forced open by human effort. May God open His doors of opportunity to you that will bring Favor, Grace and Provision. I trust that the following verse will be a Rhema word of God to you today! Revelation 3:8: “I know your deeds. See, I have placed before you an open door that no one can shut. I know that you have little strength, yet you have kept my word and have not denied my name.” The Apostle Paul operated only on the open doors God opened for him. He and his companions tested several possible options before Paul saw in a vision a man from Macedonia. They acted at once, “concluding God had called us to preach the gospel to them” (Acts 16:10). May God help you and me to do God’s work where He has led the way and where He has opened a door for the preaching of the gospel. Act on the open doors which God opens in your life. Father, Bless each who read these words today. Encourage our hearts to continue to ask and seek and knock on doors, and by Your power, open the doors that will empower us to do Your will. Amen.